The iPhone 5 is the epitome of point-and-shoot, but the deceptively simple interface of the camera actually hides a few of advanced features. There's tap focus, geotagging, HDR mode and the new Panorama mode. One thing that camera enthusiasts appreciate and the Galaxy S III doesn't have (not even the Nokia 808 PureView) is the AE/AF lock. 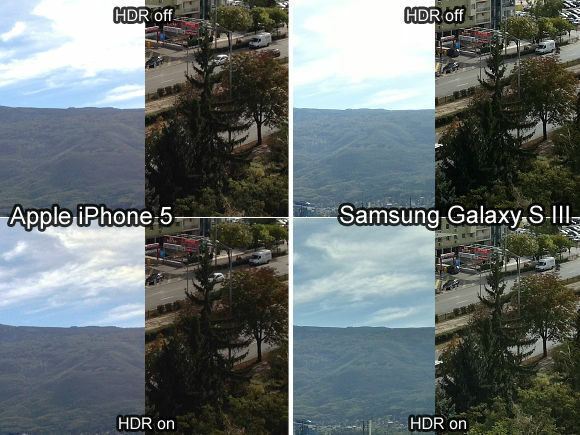 Meanwhile, the Samsung Galaxy S III camera has every feature Samsung devs could think of. The customizable UI will help bring out the ones you use most often, but there are so many features it will take you a lot of time to go through them all. 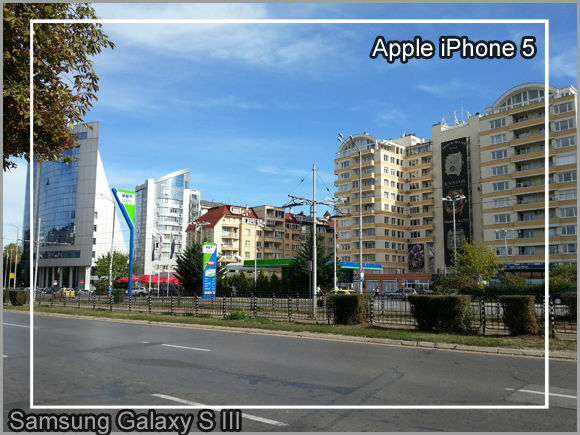 The Galaxy S III matches the iPhone 5 in that it has HDR and Panorama modes, but it also adds things like burst shot, adjustable image properties (ISO, exposure compensation, etc. ), scenes, share shot and beauty shot. Here are some crops to highlight the differences between the two cameras. The iPhone 5's camera is a bit sharper, though it helps that its field of view is narrower than that of the Galaxy S III (which fits more of the scene and thus there're fewer pixels to describe each object). Both show fairly accurate colors, though the Apple smartphone gets closer to the real look of the scene. The iPhone 5 usually tries to preserve detail in the shadows, while the Galaxy S III is okay with sacrificing detail in the shadows to try and keep some in the highlights. Anyway, here are the full resolution photos we used for the crops. Our Photo quality comparison tool has some standard shots with both phones if you feel like a round of pixel peeping. In difficult lighting situations, you can always go for the HDR mode. It requires a firm hold and it's not suitable for fast action scenes, but it can make a big difference. Both phones manage to bring out detail in the really bright parts of the image (the clouds with the sun behind them), but the Galaxy S III does a better job of bringing in detail in the shadows. The contrast of the HDR shots is on the conservative side, so you can edit the photos later, but the photos look a little "flatter" than the ones from the iPhone 5, which produces images of more limited dynamic range, but better contrast. Here are some more crops to show how each phone does in HDR mode (photos were downscaled to 25% before the crops were made). You can have a look at the full-res shots too if you want to see HDR photos at 100%. Oh, and keep in mind that if you point the iPhone 5 camera at a bright light source, you might get purple flare in your photos. And finally, lets take the Panorama features of both phones for a spin - and quite a spin it is. 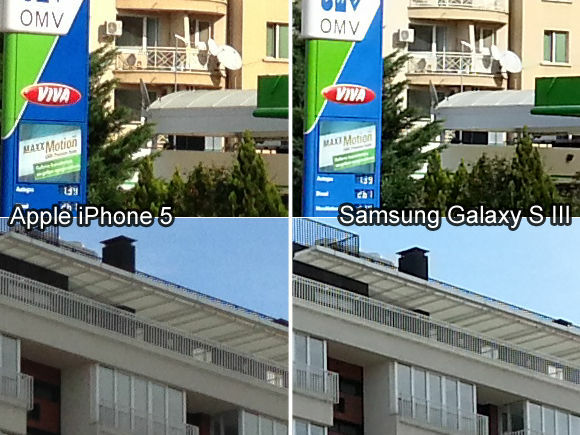 Both cameras managed to capture virtually the same area but the iPhone 5 panorama has double the resolution of the Galaxy S III one. The iPhone 5 also did a cleaner stitch - you can see the stitching artifact in the middle of the S III panorama. The Galaxy S III, however, handled the transition better from well-lit to dark in the panorama. So it's sharper images with better white balance versus some extra functionality. On one hand very few people will use those extra camera settings, so they probably shouldn't count for much. On the other, if you are looking from close enough to be able to spot the differences in image quality (things are really close) you might be among those few people. 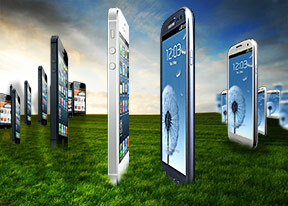 Still, we'd give the iPhone 5 the nod here, but keep in mind that it's a win by the narrowest of margins.